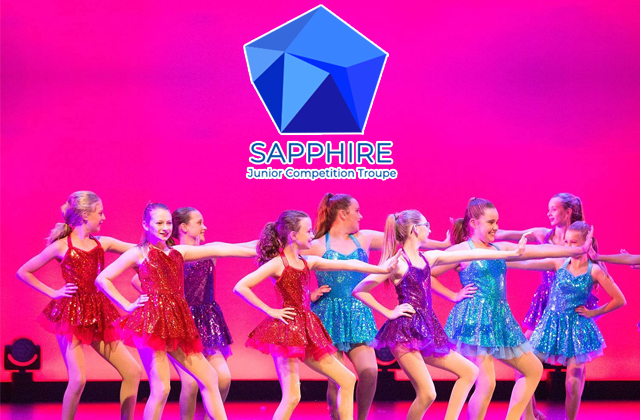 The Sapphire Competition Troupe is for our dedicated junior-to-intermediate students ready for a challenging and fast-paced competitive Troupe class. This elite group of students are required to commit to attending classes each week, warming up before class starts, as well as rehearsing and practising at home to maximise results. Troupe members must fulfil requirements (see below) and commit to attending classes each week. Some extra rehearsals may be required prior to competitions, and if students are not able to attend all required classes there may be restrictions on their participation. Troupe members who demonstrate excellent teamwork, attendance, technique and presentation may be invited to perform in special duet, trio or even solo pieces at competitions and other performances. Competition Troupe members work hard, both in and outside of class, demonstrating a positive attitude and constant motivation to work to achieve their goals! The Sapphire Troupe is an open age category. Performers should be committed, reliable and dedicated, and willing to participate in regular competitions around Perth, regardless of age. In order to join the Sapphire Troupe, members must attend at least one Ballet class, one Modern Jazz class and one other dance class at WAPS. Troupe members are required to be committed and reliable team players, and as such we request that WAPS be notified in advance of any absences that affect attendance. Entry into the troupe is by audition or invitation only. The Sapphire Troupe will perform at a wide variety of events, with the primary focus being competitions, which are generally held in school holidays at various locations around Perth. In the past our students have performed at public & community events (Fringe World Festival, Wembley Downs District Fair, Subiaco Craft Fair, Expresstival, Perth Heat baseball games, Bayview Terrace Festival, Perth Royal Show, Perth Christmas Lights Parade), televised events (Westcoast Fever Netball Flashmob event, regular appearances on Foxtel’s The Couch, Telethon, Channel 7 RAC Christmas Pageant, commercials), plus students may be given the opportunity to perform at private and corporate events as featured entertainers. The nature of these events requires performers to be punctual, rehearsed and professional representatives of WAPS. There may be extra transport and costume costs involved for students participating in external performances.